Single level to front door with doorbell to call for assistance in entering the building. 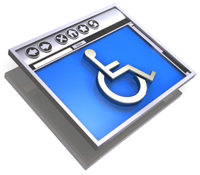 Disabled Toilets on both floors with grab rails and patient alarms. Disabled Parking Spaces near the surgery entrance. Hearing Loop. Dropped Reception desk area. Lift for first floor access.